Shampoo, cream, soup, pesticide and etc. Materials. c) It can equip with date code printer for 1-3 lines according to customers' requirements. d) Adopt particular hanging type filter, 3 sides sealing, direct hangs on the edge of the cup. e) Better tea brewing taste and beautiful bag shape make it very popular at abroad market. f) The material contact parts adopt bright 304 steel, suitable for food processing, safe and clean. 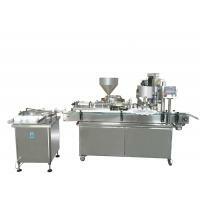 g) It adopts PID temperature controller, ensure the processing temperature is stable and seal is tight. h) Imported components are chosen for the main parts to ensure the processing precision. computer inter face design lead to convenient operation, easy adjustment and maintenance. PaymTerms : We can accept L/C,D/A,D/P,T/T,Western Union,MoneyGram,and Escrow according to different situation. 1. what the machine can be used for ? Can be used for production of Cream,paste that filled in jar,such as Hand cream,Body Cream,Face cream,Ointment,Lotion,etc. 2. How about the price and quality of the machines? a. We are the leadingl designer and manufacture for packing and filling equipment manufacturing factory .HiTai factory set up for more than 13 years.We always pay attention to the development of the industry !By comparing,we are the one of cheapest mixer and filling machine suppliers.And we can give a discount according to the quantity of machine you purchase. b. At the same time,we take effective measures to control the production process for ensuring the quality of products. Our products are passed the CE and ROHS certified.And we can supply ISO90001. Any More Information Be kind contact With Us or Visit Our Offical Website www.haitaipack.com, TKS!